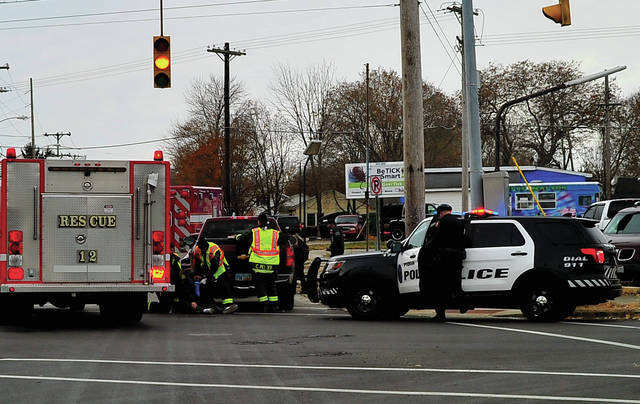 Mike Ullery | Daily Call Piqua firefighters, medics, and police work at the scene of a two-car crash on South Street at McKinley on Wednesday afternoon. A total of four victims were transported to the hospital by Piqua Fire Department medics. None of the injuries is believed to be serious. Mike Ullery | Daily Call Piqua police investigate a single-vehicle crash that occurred on Piqua-Troy Road near Garnsey on Wednesday afternoon. PIQUA — First responders in Piqua were kept busy on Wednesday afternoon. A two-vehicle crash occurred on South Street at McKinley around 2 p.m., when a vehicle apparently rear-ended another. Four victims were transported to Upper Valley Medical Center by multiple Piqua Fire Department medic units. 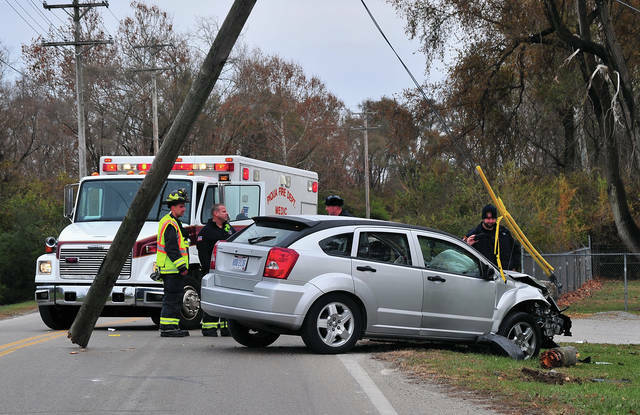 A short time later, Piqua Fire Department medics were called to another crash, this one on Piqua-Troy Road near Gainsay Street, where the driver of a car lost control and struck a utility pole. The impact sheared the pole at the base, with the pole landing in the middle of the roadway. The driver was taken to UVMC by Piqua medics. Piqua-Troy Road was closed for a couple of hours following the crash while utility companies replaced the pole. Piqua Police are investigating both crashes. None of the injuries appears to be serious. https://www.dailycall.com/wp-content/uploads/sites/30/2018/11/web1_111418mju_crash_sourth-1.jpgMike Ullery | Daily Call Piqua firefighters, medics, and police work at the scene of a two-car crash on South Street at McKinley on Wednesday afternoon. A total of four victims were transported to the hospital by Piqua Fire Department medics. None of the injuries is believed to be serious. https://www.dailycall.com/wp-content/uploads/sites/30/2018/11/web1_111418mju_crash_piquatroy-1.jpgMike Ullery | Daily Call Piqua police investigate a single-vehicle crash that occurred on Piqua-Troy Road near Garnsey on Wednesday afternoon.